A trend I keep seeing over and over is exposed wood beams. I actually don’t really see them as being trendy, but more so being a classic look for nearly any decor style. I love the textural component mixed with the smooth walls. When paired with white walls, it adds interest and depth to the room. It heightens the design element of the room – while also making it feel a bit more cozy and relaxed. Here are a few images I found that really play up how beautiful exposed wood beams can be in nearly any room in your home. Happy Monday y’all! Hope everyone had a nice weekend! My friends Rachel and Ryan have purchased a new home and will be moving into it soon (less than two weeks, guys!). Rachel mentioned that they just got some slipper chairs out of storage and it made me start thinking about how much I love the look of a set of slipper chairs. They aren’t bulky and look so sleek, so they’re a great addition to just about any room when you need extra seating. I’m headed to Asheville, North Carolina, later this week with my mom, her best friend, my sister-in-law and my niece for a girls weekend. I haven’t been since high school, so I’m excited to experience it as an adult, do some sight seeing and eat some delicious food (duh). If you have any recommendations for places to see, things to do or restaurants, please pass them along! I’ve had this image saved on my desktop for a few years now. It’s one of my favorites. I love the mix of chic and casual. I’m working on switching out a few things in our living room and I have a feeling a lot of what I plan to do will mimic the look and feel of this room. Gorgeous, right? Whites. Blues. Leopard. Heart eyes. 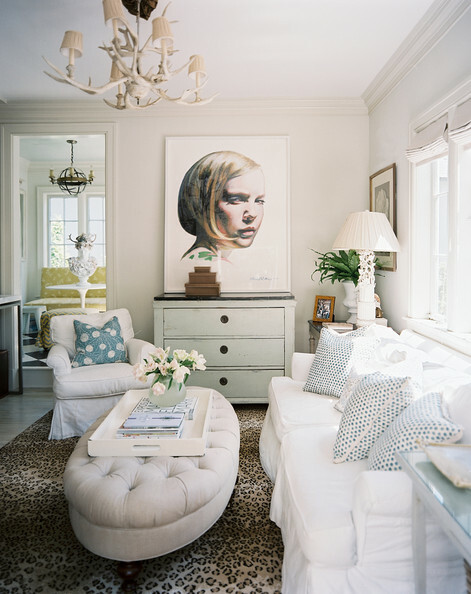 I’ve always had a love for blues and whites, and I know I can’t be the only one loving this living room. 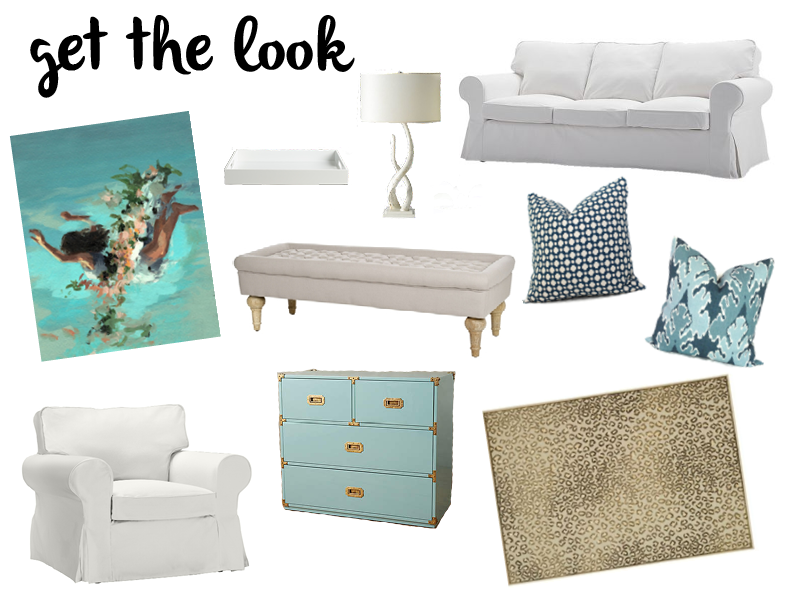 So, let’s see how you can get the look! I hope everyone’s week is off to a great start! I’ve gotten a good bit of our Christmas shopping done and it’s so nice to start crossing things off my long list of to-do’s!